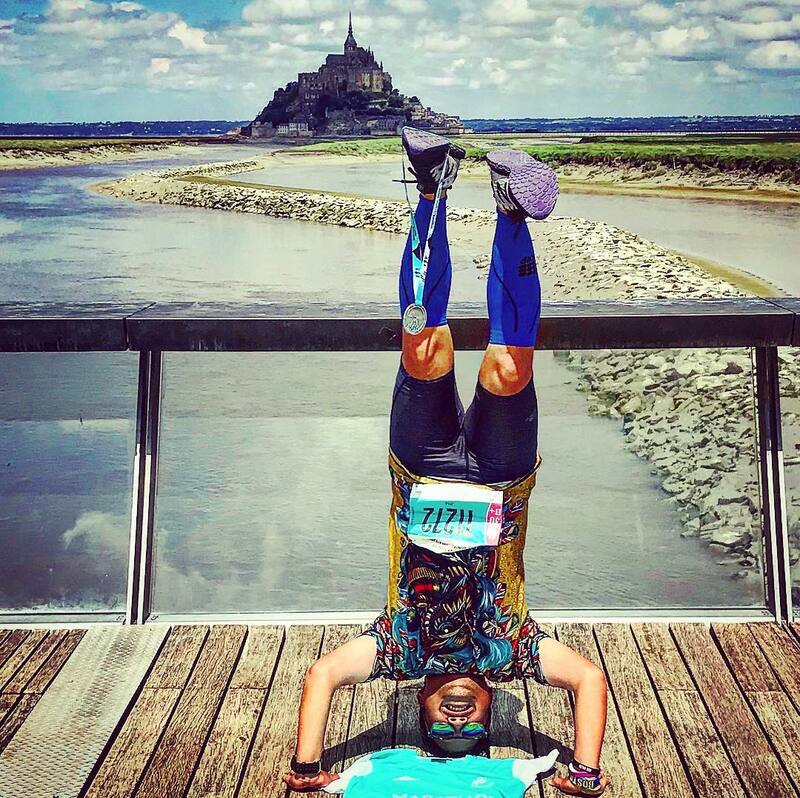 The obvious choice for a marathon in France would be the Paris Marathon in April. 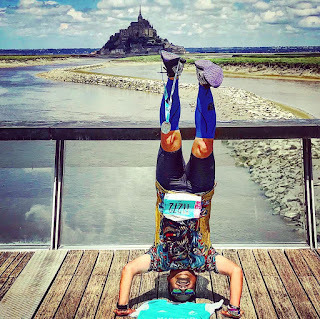 But as a self-professed Francophile, I was immediately drawn to the Marathon de la Baie du Mont Saint-Michel, a point to point race occurring near the historic island of Mont Saint-Michel, a site I had learned about while studying French during my high school years. The plus side was that the race was occurring over Memorial Day weekend, so I automatically had an extra free day to tack onto the weekend. So it got added to my schedule, and I went about planning for a hop across the Atlantic to France! After work on the Friday I left, I headed to the airport, expecting to be greeted by horrendously long lines for the holiday at one of my least favorite terminals at JFK, Terminal 1. Despite Air France being part of the TSA PreCheck program, it's practically useless at this international terminal. 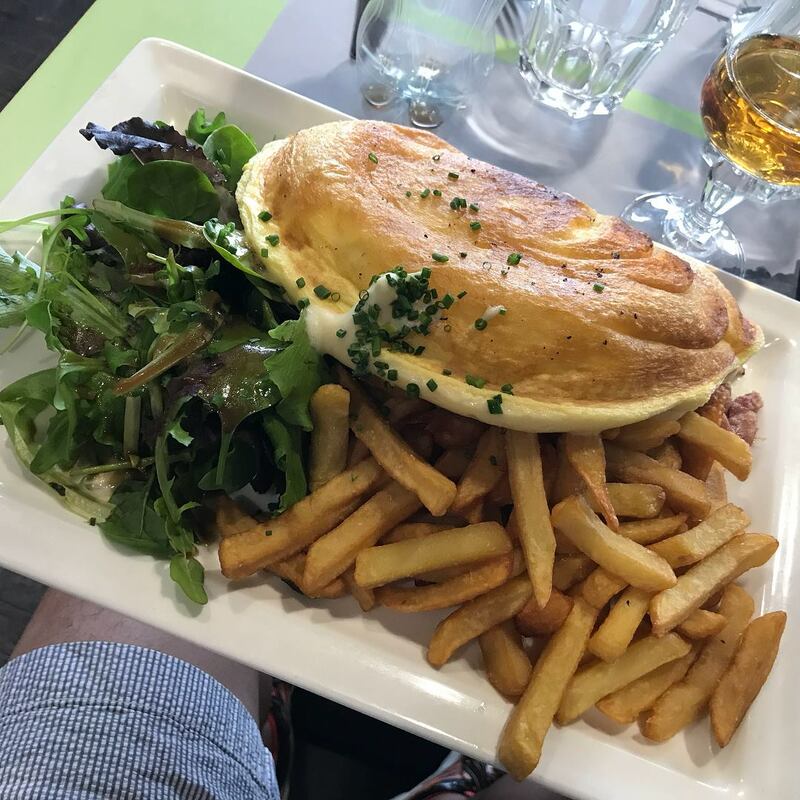 Thankfully, after arriving and getting my boarding pass, the lines were not as long as I thought them to be, and I got through security quickly, giving me ample time to utilize the Air France Lounge to have a quick meal before my flight. The flight to Paris' Orly Airport was comfortable in the economy section of the plane. 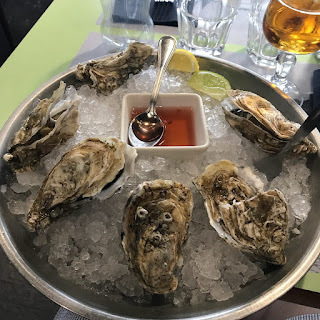 The meal wasn't bad, and I was able to get enough sleep on the overnight flight landing before 9am at Paris' second airport. Orly is known to be a bit of a dated airport, comparable to New York's LaGuardia airport, and is known to be chaotic to depart out of, but I was only arriving here. The massive Boeing 777 we flew out of came to a stop out on the tarmac, and we had to deplane down stairs and board buses to get to the terminal. I was near the front of the plane and the bus, so I was able to get through immigration and customs quickly, and grab the first Le Bus Direct service headed to Paris Montparnasse station, giving me more than enough time before my scheduled train ride out to Rennes, in Brittany. I bided my time, by having breakfast at a cute brasserie nearby, and walked around the cute streets nearby in the 14th arrondissement. My train was departing a little after noon, and would take two hours to get to Rennes, due west of the French capital. I had a bit of extra time in Rennes as well, before my bus ride to Mont Saint-Michel, so I walked around the downtown area, staying close to the train station, and also had my first taste of Breton cuisine (a savory galette.) I got to see a beautiful garden just north of the river that flows through town, La Vilaine. I wish I got to explore more, but I only had a couple hours, and had my backpack with everything I had on me. The trip up to Mont Saint-Michel from Rennes was 45 minutes long, heading through the pastoral Brittany countryside. 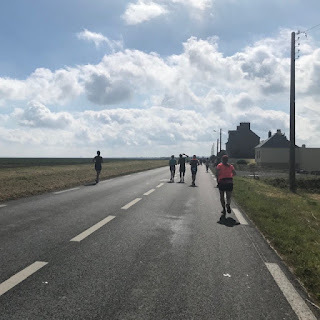 The bus was fairly empty with only around 10-15 passengers, and aside from a Filipino family I befriended while waiting at the bus terminal, it seemed like the rest of us were headed to Mont Saint-Michel specifically to participate in the marathon. One of these folks was a man named Jeremy, visiting from Malta, and running his third marathon. 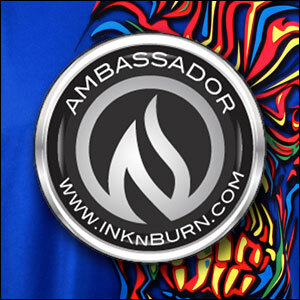 We would exchange information upon arriving and meet up the following day, after the race. 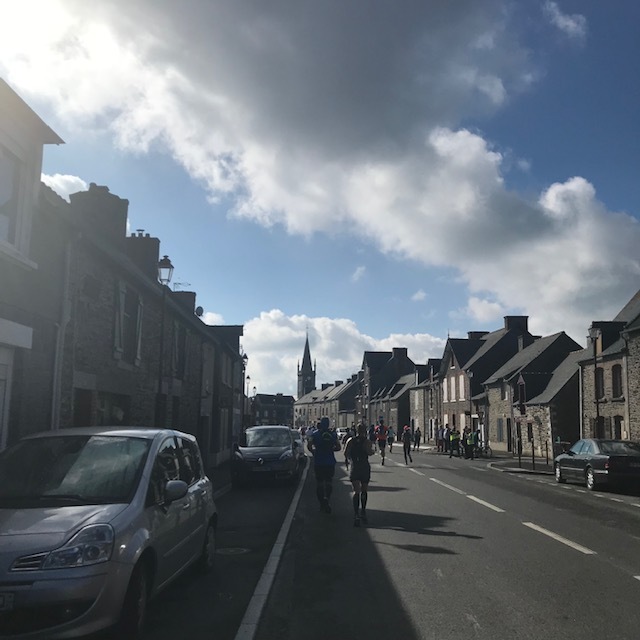 As we headed closer to our destination and into the visibly similar but altogether different region of Normandy, the abbey came into view, and it was just as majestic as you'd think it would look, upon first seeing it in real life. The bus dropped us off, and it was a short walk down the main strip to my hotel. 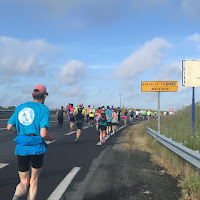 Already, I saw several folks walking around wearing medals from the two races that had happened that morning, the 55-kilometer (34.17 mile) Trail de l'Archange trail race and the half marathon length Semi d'Avranches, both running from points along the east of the bay and culminating at or near the iconic mount. 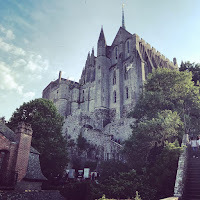 At 6pm and the sun beginning to wane, I headed to Mont Saint-Michel, waiting at the convenient bus stop in front of my hotel, to catch the bus to take us across the causeway to the island. Finally seeing Mont St. Michel! 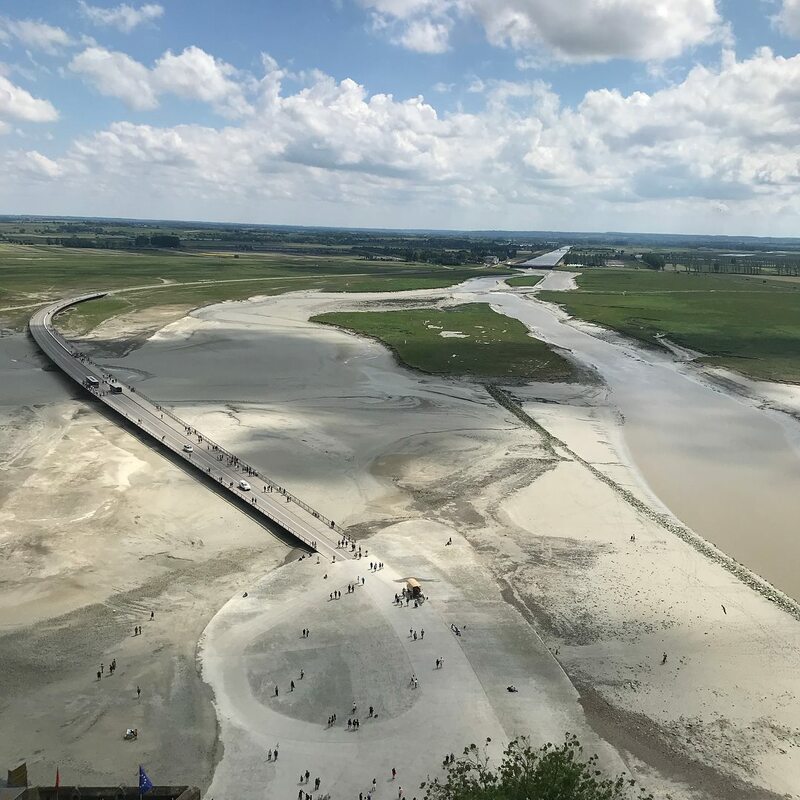 Mont Saint-Michel is located about one kilometre (0.6 miles) off of the coast, at the mouth of the Couesnon River, situated just within Normandy right off the border with Brittany. Throughout its long history, first as a fortification and later as the seat of the monastery from which it draws its name, the tidal island has been accessible at low tide to its many pilgrims, but also defensible as an incoming tide stranded, drove off, or drowned would-be assailants. 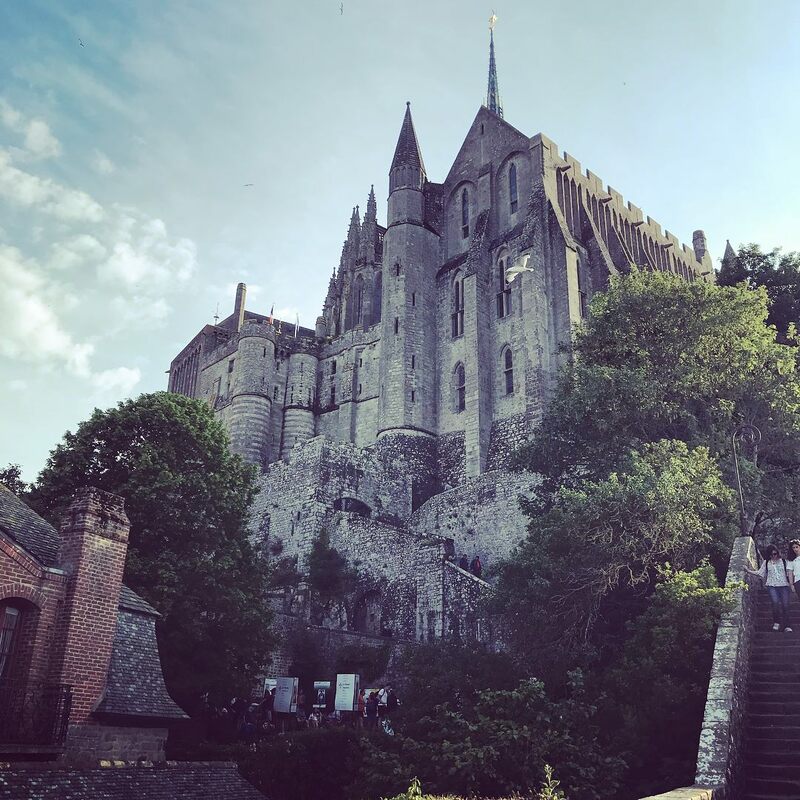 The connection between Mont Saint-Michel and the mainland has changed over the centuries. Previously connected by a tidal causeway (a path uncovered only at low tide), it was converted into a raised (and permanently dry) causeway in 1879, preventing the tide from scouring the silt around the mount. Over the years, the bay silted up due to polderization of the coastal flats along the bay shore to create pastureland for sheep and other livestock. Vehicles would also drive up and park right near the island, eroding the land. In 2012, a hydraulic dam, the Barrage sur le Couesnon, was completed, encouraging removal of the accumulated silt by using waters from the river, and two years later, a new bridge was constructed, allowing the waters to flow freely around the island and improving the efficiency of the now operational dam. Special shuttle buses regularly make the trip from the new car parks, now located roughly 2.5 kilometers away, up to a point along the bridge, from where visitors can walk up to the entrance gates of the island. Once passing through the gates of the island, I felt like I was in a scene from Harry Potter! A specialty of the region - omelettes! 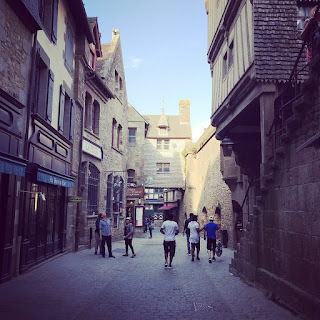 I spent the next two hours on my own discovering the maze of streets and alleyways all along this beautiful landmark, one which I've studied since high school French class, and has always been a bucket list location to visit. 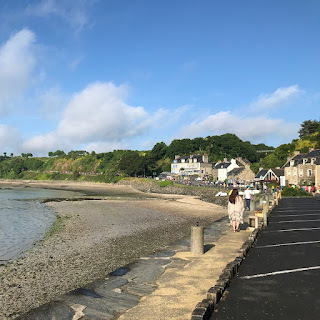 Unfortunately, the abbey was closed to visits by 5pm, so I vowed to return the following day after the race before I headed back to Rennes, to get a chance to visit the abbey at the very top of the island. 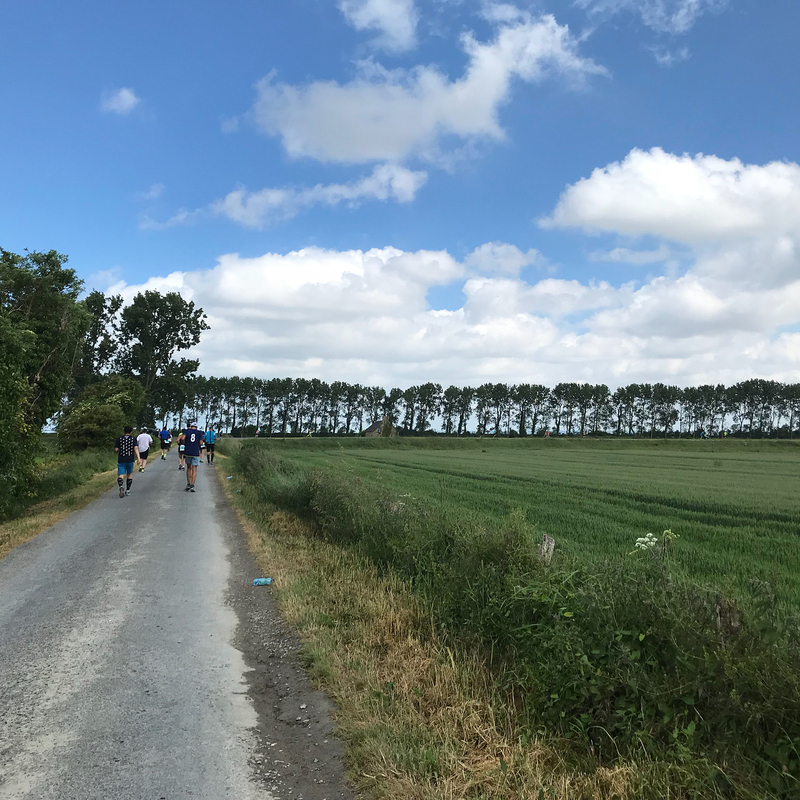 While walking around, I befriended another runner, a Filipina expat named Bernadette, along with her American husband Richard, who were now living in Belgium. 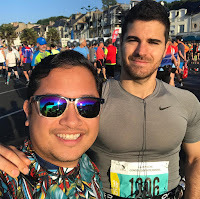 Before leaving the island, I had a hearty pre-race meal at Les Terrasses Poulard, enjoying a three course meal which included Normandy oysters, a traditional Mont Saint-Michel fluffy omelette with bacon and fries, and a tarte tatin apple pie slice, all washed down with some Breton sweet cider. All the while, I could see the sky in the distance get darker and darker, with imminent inclement weather approaching. Before long, I knew it was time to head back. The skies were ominously dark, and the winds had picked up considerably. I captured some vivid photos and video of the expanse all around us, lightning flashing in the gloomy distance to the south and east, abruptly fading into an ombre of wispy clouds in the vibrant sunset in the north and west. 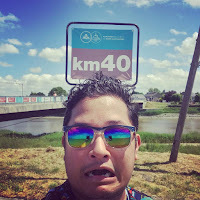 I could feel the air saturating and that rain was coming soon, so I decided to make a run for it to the buses up further along the bridge, already crowded with passengers. With room for me to jump in, the rain began to fall, and I made it just in time before the downpour started. Unfortunately, despite being safely in the confines of the bus, the roof hatch was ajar for ventilation purposes, and the rain was getting in. Within minutes, the rain turned into slightly less than marble sized hail, and that was coming through the hatch, as well. It was truly a sight to see, and an experience to remember - the bus finally arrived at the bus stop in front of the hotel, and despite making my best efforts to sprint across the parking lot to the hotel lobby, I was fully drenched from top to bottom from the pouring rain. I settled in for the night, laying my clothes out and watched some French game shows, before calling it a night. The next morning, the weather we had the night before had passed, and we were left with damp ground afoot, but otherwise, a beautiful morning for a race. 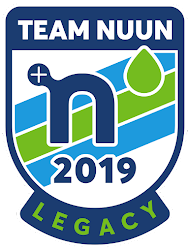 I quickly threw my race clothes on, and packed up my stuff in order to check out of the hotel, since check out would be happening when I was in the middle of the race. I left my backpack with the lobby attendants, who would kindly keep my bags for the rest of the day until I needed them again after the race. 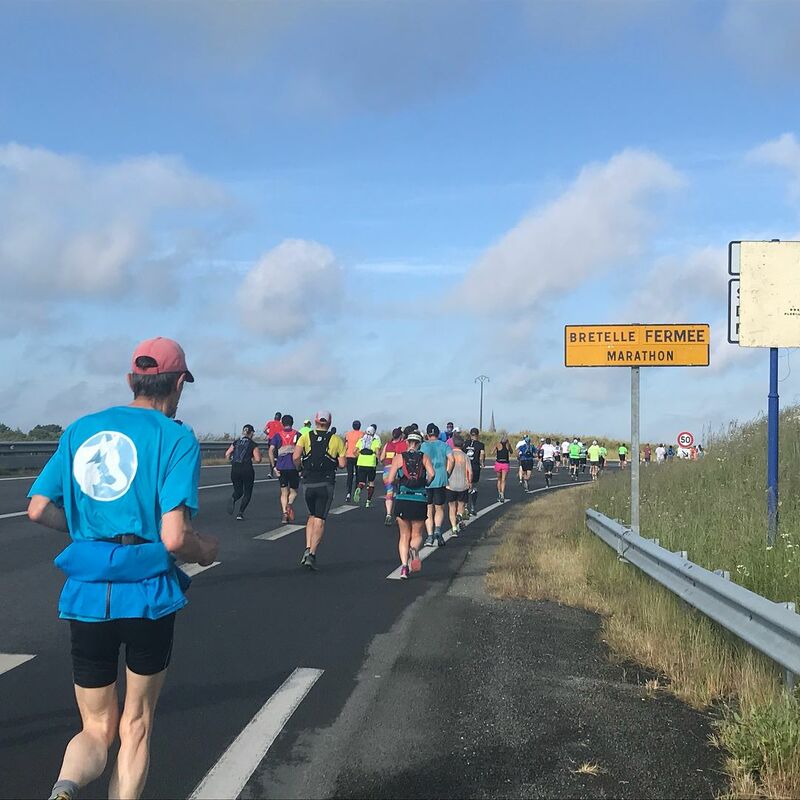 I walked over to the P7 parking lot, where shuttles were organized to take marathoners out to the startline roughly half an hour away in Cancale. 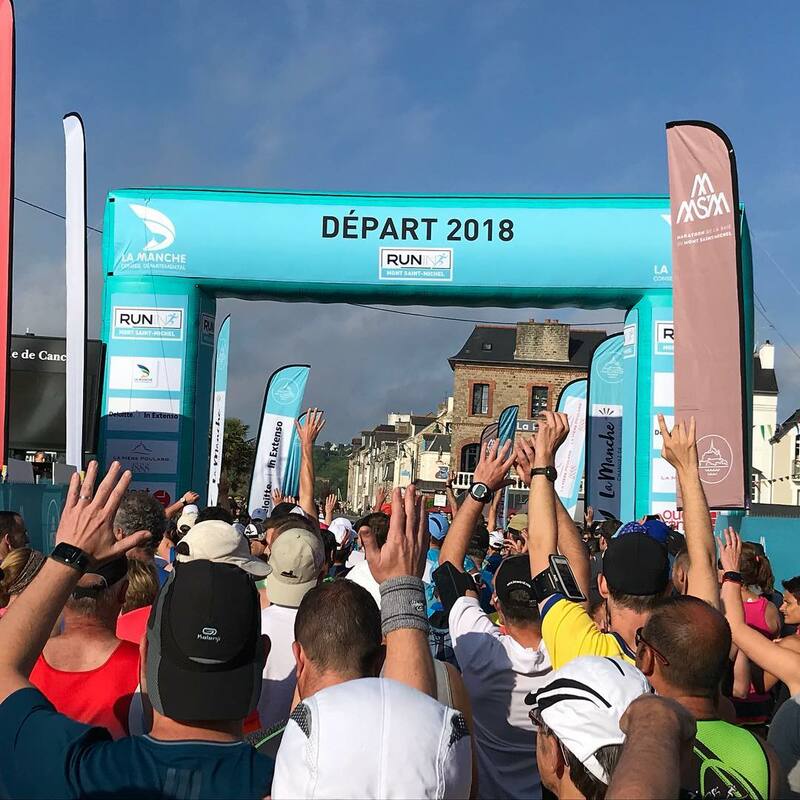 Cancale received the runners in multiple buses with open arms, and the excitedness for the race start was palpable in the air. We congregated in the port area of this sleepy fishing town, known locally as the "oyster capital" of Brittany. I ran into both Bernadette and Jeremy at the start, as well as befriending a couple other Americans running and visiting the area, and in the corrals with two American expats now living in Germany. After a slight delay, we were off and running, with the exposed morning sun already signalling to us it would be a warm day. 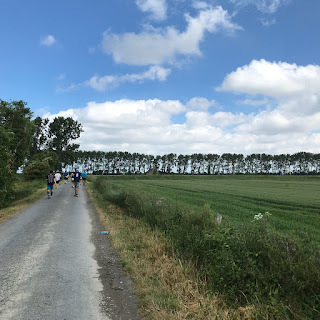 Within the first mile, we began to ascend the small hill along the Route Panoramique, circling the edge of the bay, as we made our way out of the town's portside area. I began to break a sweat as we reached the highest point of the race, running in a shaded section bounded on both sides by tall trees. 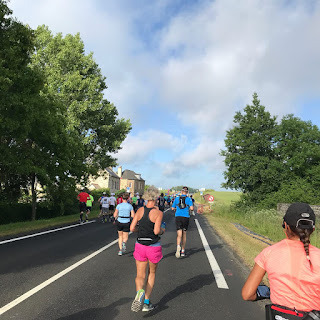 The course continued as we turned left onto departmental road D76, along a nice straight shot that eventually took us along a down ramp into the commune of Saint-Méloir-des-Ondes, to transfer onto the largely downhill D155 road. Along the way, a runner dressed in a full fireman's uniform passed me by. I hit the 5K mark in a comfortable 30 1/2 minutes. The course flattened out, which it would be for the remainder of the race, as we began to run toward the coast until the road began to run right alongside the coast, turning into Rue du Bord de Mer. 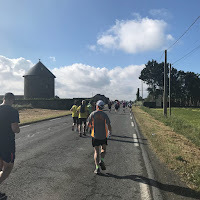 We ran through the coastal commune of Saint-Benoit-des-Ondes, to the towns of Vildé La Marine, La Bout de la Ville, and La Quesmière in the commune of Hirel. All along the way, Mont-Saint-Michel was quite far in the distance, and in the marine layer of the morning, you could just make out the outline of the abbey. Townsfolk in all these quaint little Bretagne towns cheered us on, many waving the unmistakeable flag of Brittany, also known as the Gwenn-ha-du, which means "white and black" in the Celtic language of Breton, a regional language in this area. The flag of those colors has nine horizontal stripes represent the traditional dioceses of Brittany into which the duchy was divided historically, with the black stripes representing the French speaking dioceses and the white stripes as the Breton speaking dioceses. In the right corner is an ermine canton, with eleven 'ermine spots' representative of the way the black-tipped tails of the ermine, or short-tailed weasel (a national emblem of Brittany) were hung on the white fur. 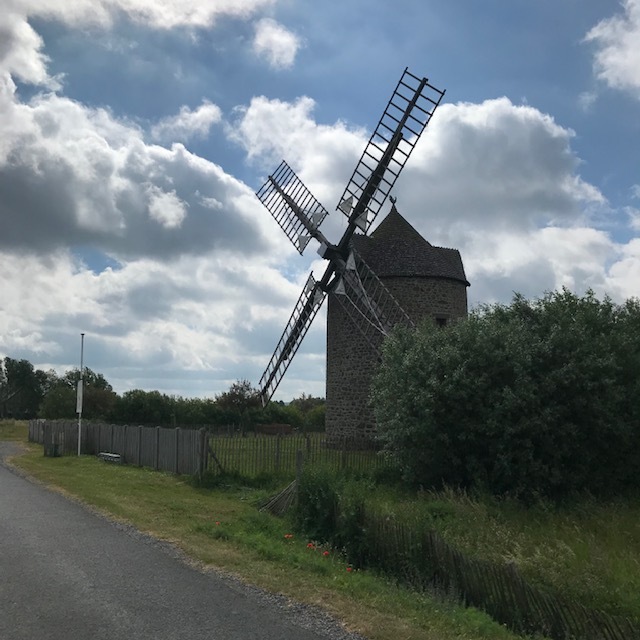 A windmill, or moulin, along the course! 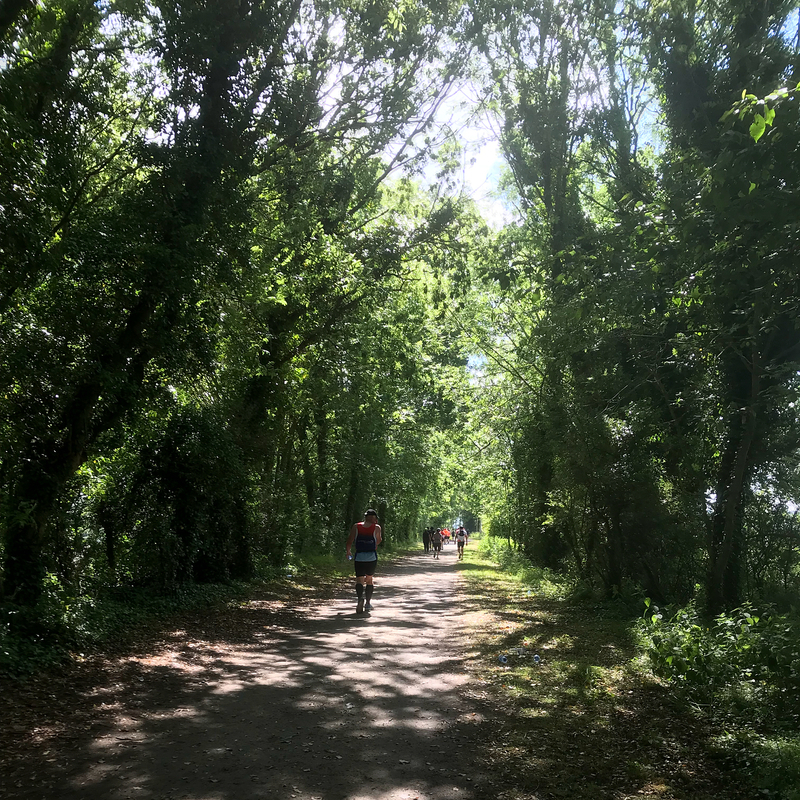 In the commune of Le Vivier-sur-Mer, the course took a short detour off of the coastal road, as we did a roughly 1/2 mile loop along an area of reclaimed land that housed a boat supply and boat builders company, and some manufacturers. 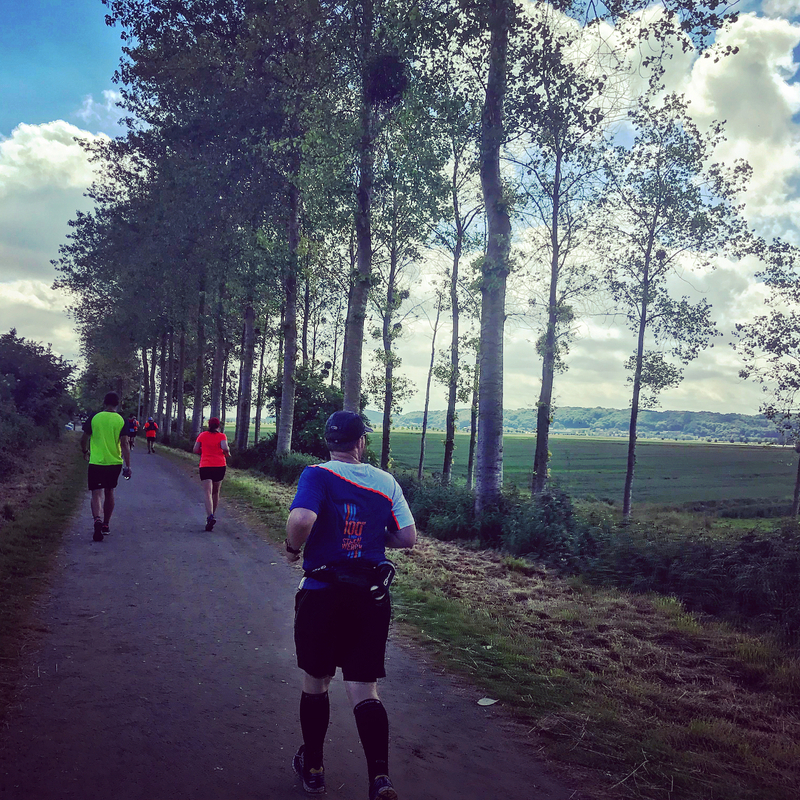 It wasn't the prettiest part of the race, that's for sure, but it was short, as we continued to run east along the coast toward Cherrueix. We came off of the road for a short period, running along the Route de la Saline, where we got to run by one of the commune's historic nineteenth century windmills. 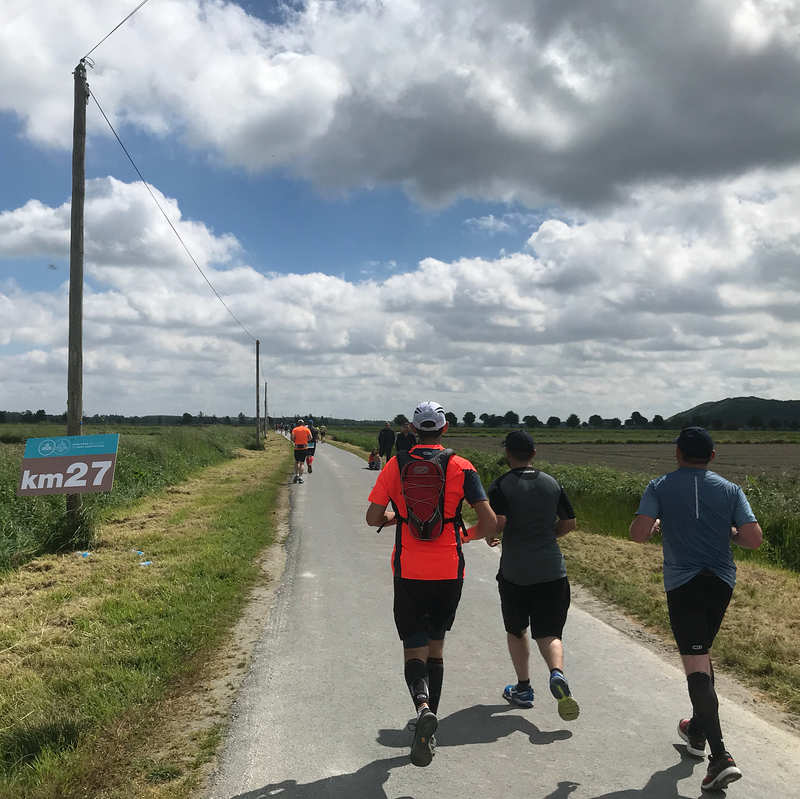 After the 12 mile mark, we turned right onto the main street that passed through Cherrueix. I distinctly remember passing by a small garden of red poppies along the side of the road at mile 12. It was so fitting seeing these, with Memorial Day being the following day in the US, as poppies have been associated as a memorial for fallen soldiers dating back to the early 1900s. In fact, the flower is the official memorial flower for the Veterans of Foreign Wars. We ran through the center of Cherrueix, past lots of spectators, as this was the halfway point; full marathoners veered left to continue on, while the duo-marathoners had their exchange point near the town's main church, the Notre Dame de la Garde. As we left Cherrueix, I heard bagpipes playing, a uniquely Breton musical instrument. Played by two instrumentalists, the duo, known as "sonneurs de couple" consist of a talabarder and biniaouer, the former playing a double-reed woodwind "bombard" similar to an oboe or clarinet (and thusly, playing music sounding much like klezmer music) and the latter playing a Breton bagpipe called a binou kozh. 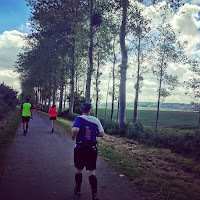 We ran through the largely residential towns of Le Han and Le Lac, feeling overly exposed to the sun. 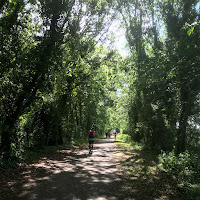 Thankfully, by mile 15, the route took us to a tree-lined trail, offering us a much needed respite from the oppressive heat. Running under the shade of a nice canopy of trees reduced the temperature by a good five degrees, and we got to run under the shade for the next mile. 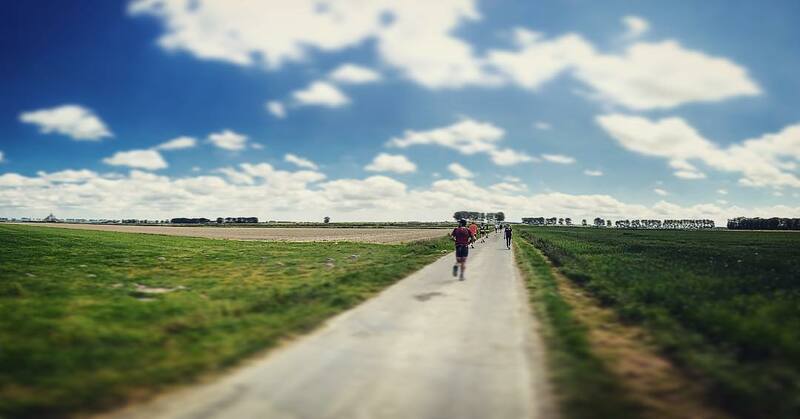 We emerged out of the trees to run a very exposed route with long straight sections into the open polders. 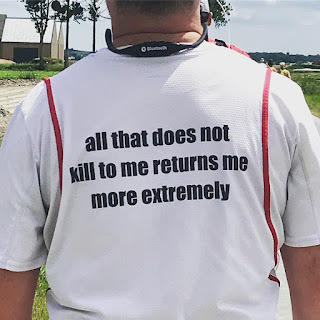 16 miles into the race, and the next nine miles would be very monotonous and for the most part unmemorable. 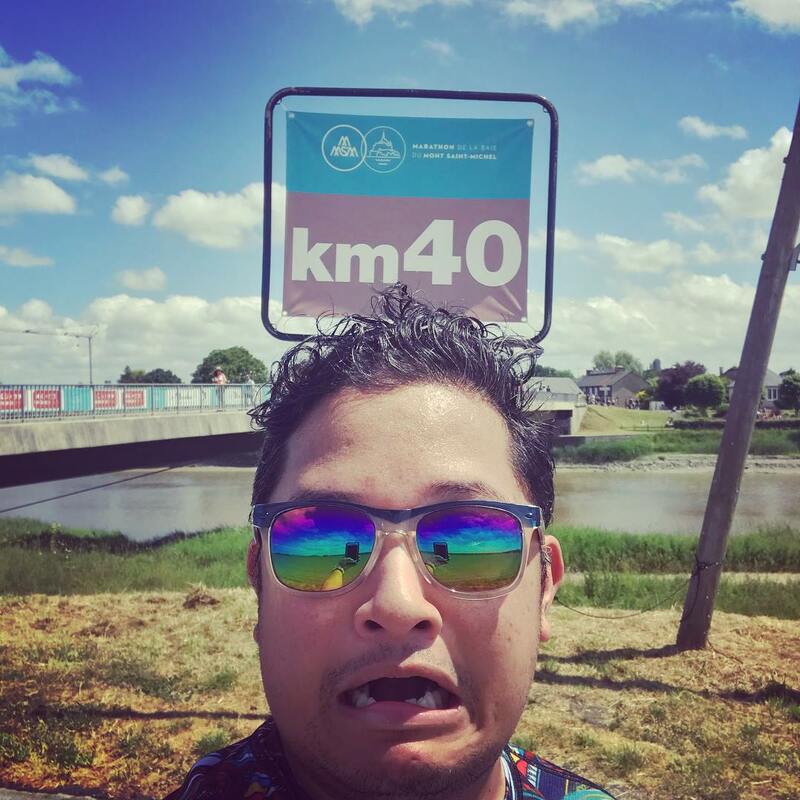 All I can remember was, "fine, Mont Saint-Michel is getting closer, we're running on very flat terrain, my electrolytes are low... and DAMN it's hot out here. The clouds are not doing much to shade me from that sun. I'm going to get BURNT." 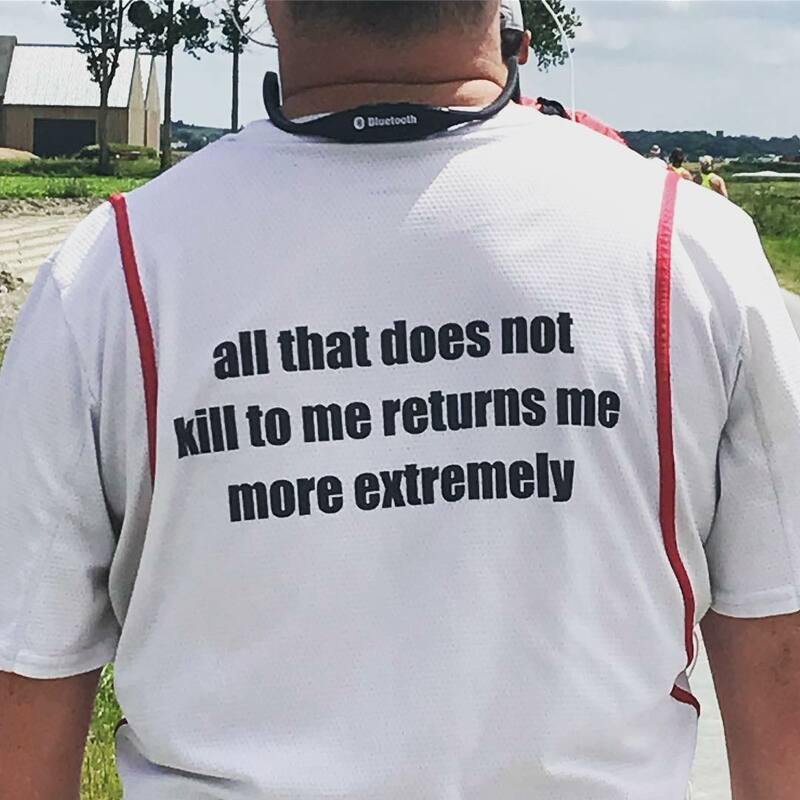 I did manage to pass a few runners who were clearly struggling in the heat in the last few miles, including a guy who clearly had an incredibly poor English translation of the Nietzsche quote, "What doesn't kill you makes you stronger," written clear as day on the back of his shirt. A very poorly translated quote. At mile 25, the course crossed the Couesnon River, and we ran alongside it on a sidewalk teeming with spectators and runners who had already finished the race. 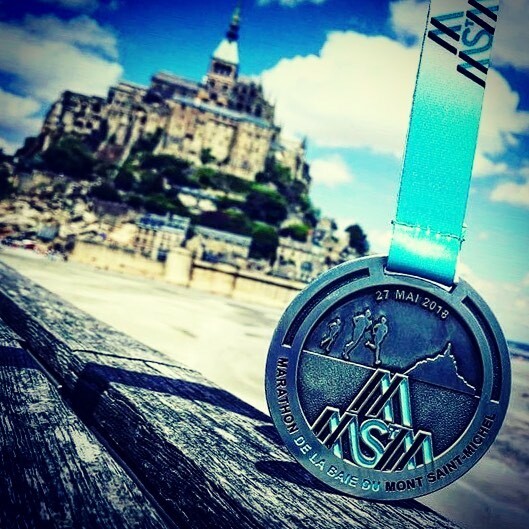 Mont Saint-Michel was in clear view, as was the Barrage, which was the end point of the race. 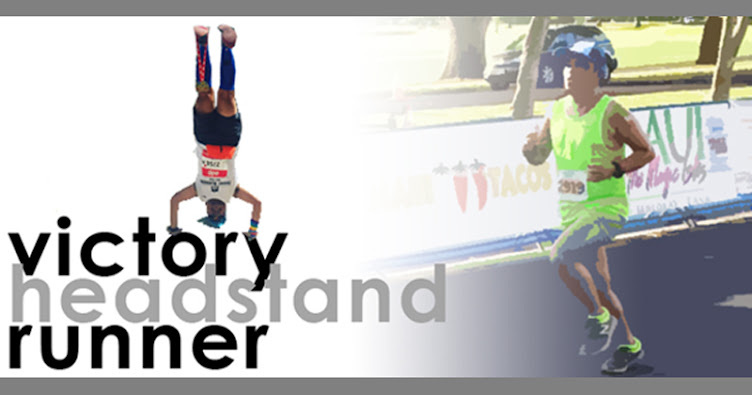 I toughed it out and got myself to the finish line in 5:10:21. I found Josh, one of the American expats living in Germany that I met at the start, just after receiving my medal, as he had finished some five minutes before I did. After passing through the food tent (where they gave out cups of Coke, which was SOOOO refreshing, especially since there was no energy drink or electrolyte at all given throughout the whole race!) and getting to sit for a little bit, I had Josh take my headstand photo for me, before I headed off back into town to grab a much needed shower back at the hotel. Despite being checked out already, they provided me the opportunity to use their facilities to take a shower, but only at the campground area behind the hotel. It was a little rough, but at least I got rinsed. Finally seeing Mont St. Michel in the distance. After my shower, I realized that Jeremy was in the same hotel as me, and staying an additional night (which meant I probably could've gotten a proper shower, but oh well). 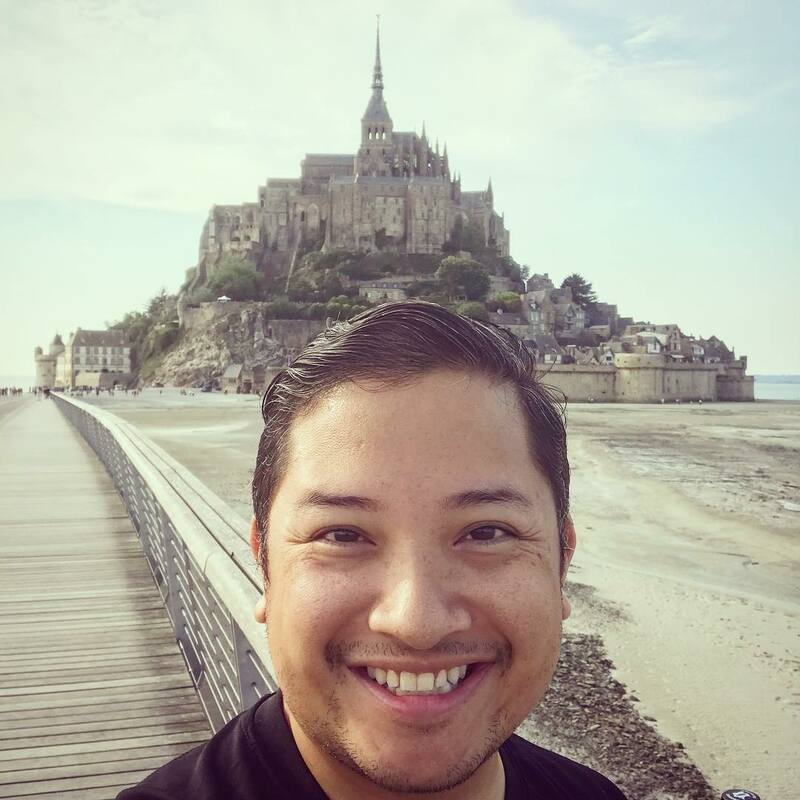 I had a few more hours left before the last bus back to Rennes, so I wanted to take advantage of the time by returning to Mont Saint-Michel. 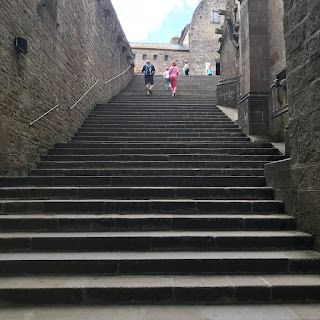 With Jeremy joining me, we took the shuttle buses across the causeway and ascended the mount on tired and sore legs, going even higher up to the abbey, which was open for tours for €10 admission. We got there just in time as an English-language guided tour was happening, which we were able to join, getting to hear a bit of the history of the abbey, its unique architecture, and how the mount came to be. 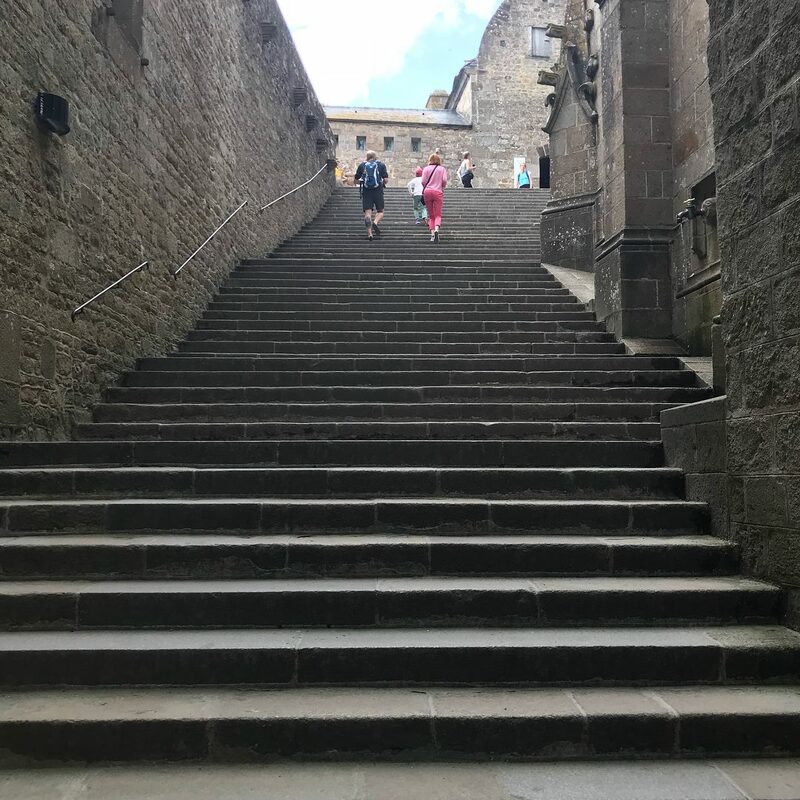 So many stairs ahead of me, just because I wanted to see the abbey. So high up... everyone looks like ants! After the tour, we returned via shuttle back into "town" so I could grab my bag and then head straight to the buses for my scheduled departure. There were A LOT of folks taking the bus back to Rennes, and it turns out, they overbooked, so I had to take a separate bus with the rest of the folks that didn't make it on the first bus. I appreciated it though, because I got the same entertaining bus driver who drove us the day before, and I didn't have quite as many people to have to share air conditioning with, haha. I snoozed for most of the 45 minute trip back down to the city. Upon arriving back in Rennes, I found out that my train trip the following day was one of many that were cancelled due to the ongoing train strikes plaguing the entire country. The SNCF at least provided the specific days they were going on strike, and while I knew there was a high probability that this would happen, I still had kept my fingers crossed that my trip would remain unscathed. I purchased a non-refundable bus ticket as a contingency plan just in case, but unfortunately, it would be an uncomfortable 5+ hour ride. I decided to head into the Rennes train station to see if I could perchance exchange my train ticket for a potential earlier train; unfortunately, it seemed everything was fully booked. Not one to be denied upon my first option, I tried it again with a slightly altered route, and all of a sudden, a seat had opened up, giving me the chance to exchange the ticket to an earlier train that was running without any additional charge. I'd be able to get into Paris, and have more time to spend before making my way to the airport. After dinner (a much craved-after entrecote of steak, plus a Breton favorite dessert, a Kouign Ammann), I headed back to my hotel, a short walk from the train station, where I booked for the night. After a comfortable night's sleep, I woke up early the next morning, to check out and take my seat on the train headed to Paris. It was a pretty empty train leaving Rennes - originally, this train was supposed to leave out a couple points further west, but those legs ended up getting cancelled with the strike - but once we reached Le Mans, the station between Rennes and Paris, the train filled WAY over capacity, so much that I was asked by many folks dressed in business suits whether I had a seat or not, to which I showed them my actual ticket. I guess, such is life for living in a constantly strike-prone country! We arrived in Montparnasse by 9am, just in time for Paris rush hour. I boarded extremely crowded metro cars as I made my way to Gare de Lyon train station, where I met up with my friend Cyril, a fellow Front Runner who had relocated from Sydney to Paris recently. He worked nearby and agreed to meet me for breakfast that morning, which was nice of him. We caught up on events of our lives since we last saw each other (and first met), which was on the Staten Island Ferry on our way to the start line for the New York City Marathon in 2017. After breakfast, I took a casual stroll through the city, making my way up to the Place de la Bastille, and through the fashionable Le Marais district on my way to the Chatelet-Les Halles, where I'd catch a RER train up to Charles de Gaulle Airport. 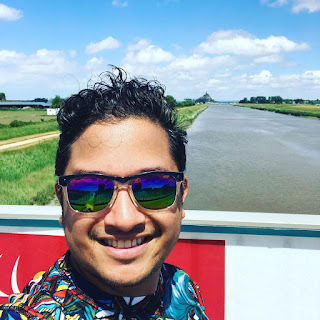 Of course, the train strike affected these trains as well, so I had to transfer at Gare du Nord, but it was pretty easy to figure out, and I said adieu to Paris as I made my way to the massive Parisian airport. I had quite a bit of time to kill before my boarding time, so I spent a couple hours in the beautiful Air France Lounge, enjoying a small meal before my flight, and knowing that I'd be fed quite well in Delta One on my way back to the US. We had an ~8 hour journey from Paris to Pittsburgh, where I'd connect on my way back to New York City. It was a long day of travel, but I'm glad I got to do it, especially seeing a site I had learned about and longed to see so many years ago.